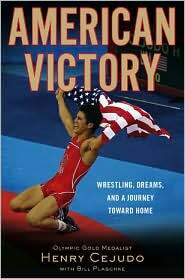 Henry Cejudo’s remarkable journey follows an unlikely hero from the mean streets of South Central L.A. to the glory of the Beijing Olympics. The first American in sixteen years to win the gold medal in freestyle wrestling and the youngest American gold medalist ever in this event, Henry’s grit, passion, and resolve on display in China was a culmination of a life spent fighting-both on and off the mat. Henry was born into a world devoid of stability, one of tiny apartments and empty refrigerators, his mother on the run from immigration, and his brothers hanging around to toughen him up with daily fights. Until he joined the U.S. Olympic team, he had never had three meals in a single day, never had his own bed, never even had a pillow. American Victory is Henry’s poignant and powerful memoir of growing up in a segment of the American population that is too often overlooked and underestimated, and how he rose above the statistics and the dangers to become a winner-a hero who embodies all that’s best and most hopeful in the American dream. Henry Cejudo is a freestyle wrestler who won a gold medal in the 2008 Beijing Olympics. Bill Plaschke has been named the Associated Press Sports Columnist of the Year four times. He has been a sports columnist for the Los Angeles Times since 1996 and is a regular panelist on ESPN’s “Around the Horn”.